I did not want to try the larger crickets. I did not even want to try the smaller crickets. But in Mexico, on the second day of a week-long academic adventure with my classmates, I was being asked to face one of my fears head on, or more accurately, antennae on. My fear is not of eating bugs, but rather of being found out as a small-minded hypocrite amongst my peers. Friends and family know me for my enthusiasm and passion for food, which has lead me to pursue a graduate degree to study the economic, social, and cultural aspects of the topic. But only those very close to me know one of my deepest, most shameful secrets: I am not an adventurous eater. I am not into offal, or steak tartare, or oysters. The thought of splitting open a lobster does not excite me – it confuses me with the amount of effort required for so little reward. Spicy foods are unpleasant at best, and brutally painful most of the time. I don’t even like sushi. “You must not have had good sushi before,” a shocked new friend will inevitably inform me. It’s not that I haven’t tried. I’ve sampled all of these items once or twice, and I try sushi about once a year, just to silence the skeptics. But it is never a pleasant experience. The raw fish, rare animal parts, and tongue-tingling delicacies that delight my classmates and friends just don’t appeal to me. My list of favorite foods sounds like the last meal request of an American inmate whose palate stopped developing at age seven. Give me cheeseburgers, chicken fingers, waffles, and chocolate ice cream with sprinkles, and I’ll die an unimaginative, but happy, death. I knew that going on an international trip with the specific intent to study another culture’s gastronomy with some seriously passionate and open eaters was going to push me out of my comfort zone. While most Americans think of nachos and burritos when they think of Mexican cuisine, the traditional fare is a rich blend of ancient and modern, with many culinary traditions originating from pre-colonial indigenous cultures. 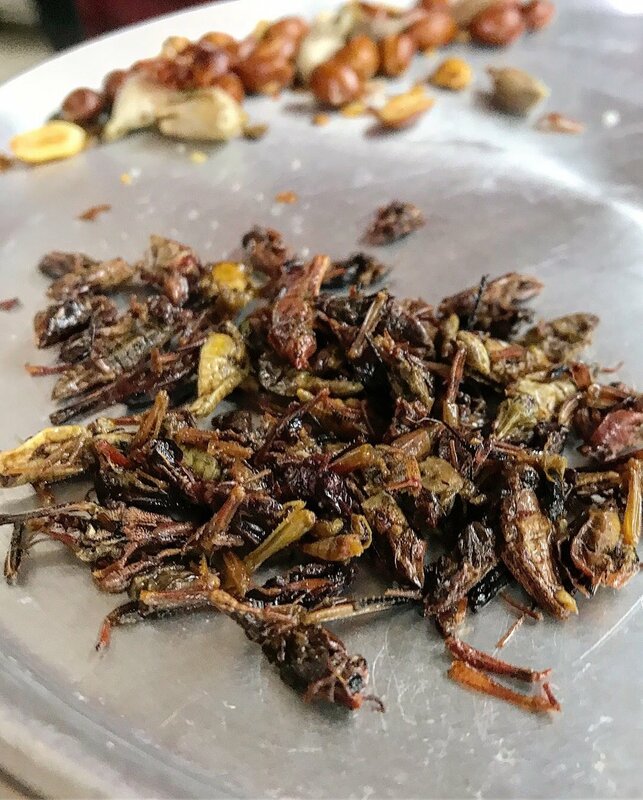 Chapulines, or crickets, are fried, tossed in a variety of spices, and eaten as a crispy snack in the outdoor marketplaces that dot the bustling streets of Mexico City. They are also incredibly healthy and sustainable – crickets are high in protein, low in fat, and require much less fuel to raise than traditional livestock. Even though insects have been notably absent from the diets of North Americans and many Europeans, a recent article in Forbes says 80% of countries in the world already feature them as a normal food staple. As growing economies like China and India develop middle classes with a taste for meat, many scientists believe eating insects is the key to solving the world’s upcoming protein debt. Entrepreneurs worldwide have started betting on their success with the use of cricket flour for baked goods and processed cricket meat for nuggets. At an academic and environmental level, I am a huge supporter of eating insects. They are nutritious, better for the planet, and can be raised and sold by nearly anyone, regardless of social class or land-owning status. But the “ick” factor still radiates from the base of my throat whenever I think about consuming them myself. How do I reconcile such strong cognitive dissonance between my brain and my mouth? I turned towards Nico, our handsome culinary tour guide, and surveyed the spread of insects on the silver tray he held with his outstretched arm. “I’ll just try a little one,” I said in a tiny voice, pinching the crispy legs of a critter that had been cooked in salt and garlic. I tossed it into my mouth, chewed just long enough to get a hint of flavor, and swallowed quickly, clearing any extraneous body parts from the inside of my cheeks. It tasted a little nutty and had the texture of the burnt, overly fried bits you find in the pan after making hash browns. It certainly wasn’t terrible, but I wasn’t rushing back to pick up the larger insects and risk feeling the separate thorax, legs, and antennae swish around on my tongue. As my classmates began nodding excitedly and chatting about their enjoyment of the morsels, I flashed a quick smile and stayed quiet. I survived another day of my contradictory existence as an unadventurous food lover, and my secret shame remained hidden with me.